Development of transferable concepts towards sustainable development of bio residues and waste materials for micro-biogas production in municipalities and counties (joint project). The joint project deals with the determination of unused potential of local biomass as well as the development of economic concepts towards sustainable development of bio residues and waste materials for distributed micro-biogas production in municipalities and counties. The project aims at the implementation of specific measures to transfer the concept to be developed for distributed micro-biogas production in municipalities and counties. In addition, a feasibility as well as transferability analysis will be provided. The realization of regional biomass usage concepts (to be developed) should pay off not only economical, but also set positive impulses for the regional economic. For the implementation of the project, a technical concept and a feasibility and transferability analysis will be constructed for the administrative district of Schwäbisch Hall. Ecological and socio-economic aspects should be considered explicitly to facilitate a permanent anchorage and later realization of the concept. 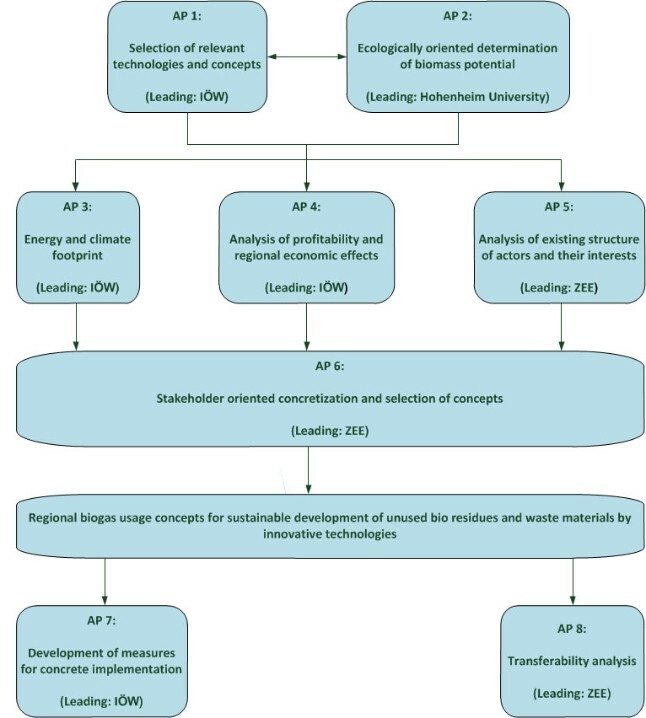 The technical options, the economic load capacity, the actor related implementation potential and the ecological compatibility are the central design criteria for the concepts. ZEE develop within the frame work of the joint project a stakeholder analysis and investigates favorable and transferable socio-economic factors.